Phase IV of Shanghai Yangshan Deep Water Port, the world's biggest automated container terminal, started trial operations on Sunday. Located at the south of Donghai Bridge, phase IV of the Yangshan Port covers 2.23 million square meters and has a 2,350-meter shoreline. Once it enters full operation, the fourth phase of the Yangshan Port will initially be able to handle 4 million TEUs (twenty-foot equivalent units). The number will expand to 6.3 million TEUs at a later stage. The project uses automated handling equipment designed and manufactured in China. The machinery used in loading and unloading, including a bridge crane, an automated guided vehicle (AGV) and a rail-mounted gantry crane, are all made in China by Shanghai Zhenhua Heavy Industries Company. A domestically developed automated management system is also used at the port to maintain safety and efficiency. 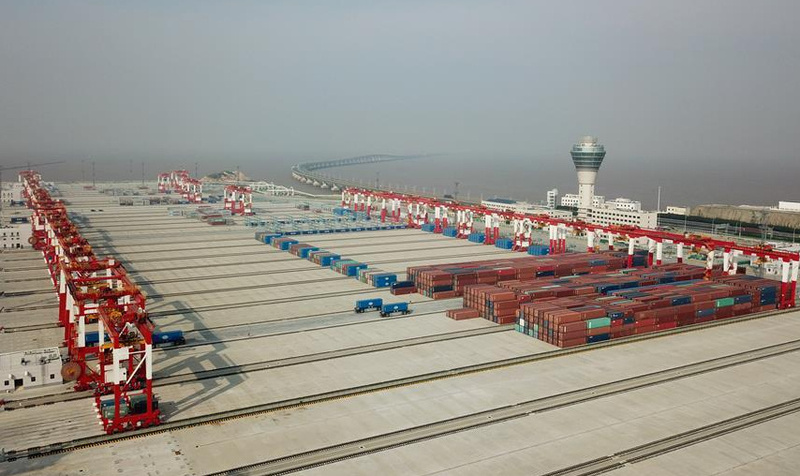 "The automated terminal not only increases the port's handling efficiency, but also reduces carbon emissions by up to 10 percent," said Chen Wuyuan, president of Shanghai International Port Group. The port will help consolidate Shanghai port's standing as the world's busiest container port and further support Shanghai's efforts to become a world shipping center. So far, the first set of machinery, including 10 bridge cranes, 40 rail-mounted gantry cranes and 50 AGVs, have been tested and put into trial operations. In the future, there will be 26 bridge cranes, 120 rail-mounted gantry cranes and 130 AGVs used at the Yangshan automated container port.